Dual hoist design allows one bag in “staging” area while other bag is discharging for rapid bag changes, and enhanced throughput. 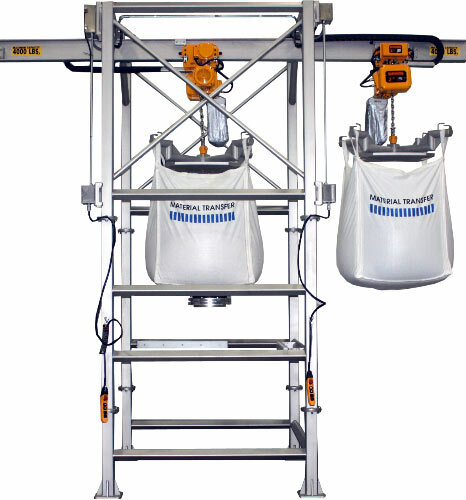 Dual Mantis™ style, ultra low-headroom bulk bag lifting frames featuring debris catch pans. Modular 4” square x ¼” wall structural stainless steel tube frame with continuous welds. Sanitary design with no tube penetrations, welded stand-offs for control enclosures and conduit, “diamond pattern” and round tube cross bracing for easy equipment cleaning. Unit features a manual iris valve to help control the flow of material during discharge into customer’s existing portable containers (not shown). Hoffman NEMA 4X stainless steel electrical enclosures.